The Assyrian people or Assyrians, also known as Chaldeans, Syrians, or Syriacs, are a distinct ethnic group of the Middle East, whose roots reach to ancient Mesopotamia. "The Zoroastrians and Jews will each elect one representative; Assyrian and Chaldean Christians will jointly elect one representative; and Armenian Christians in the north and those in the south of the country will each elect one representative." As I understand it, both Assyrians and Chaldeans are Christians and both use Syriac as their liturgical language. Assyrians are members of the Assyrian Church of the East, often referred to as the Nestorian Church, which is completely separate and independent of any other church. Chaldeans in the Iraqi and Iranian context are from the same historic community and use the same liturgy but have accepted the doctrines and authority of the Roman Catholic church -they are what is known as a "uniate" church, i.e., an eastern church in union with Rome. They are sometimes called Chaldean Catholics. If that's enough for you, stop here. If you want to peel the onion back one more layer, read on. - the Orthodox...those who accept the doctrines defined by the seven ecumenical councils that took place between 325 and 787 A.D. and are in communion with the Ecumenical Patriarch of Constantinople. - the Nestorians or Assyrians...those churches mostly in Syria and eastward to India who split with the Orthodox mainstream at the Council of Ephesus in 431 over a now-obscure point concerning how the human and divine natures of Jesus Christ were mixed in one person. The Assyrian Church is totally independent of any other church. - the Monophysites...the churches that split with the orthodox mainstream over another now-obscure point about the combination of Christ's human and divine natures at the Council of Chalcedon in 451. The Monophysite churches are the Coptic, Armenian (Gregorian), Ethiopian, and Syrian (Jacobite). To confuse things, these churches consider themselves orthodox ("right-believing") and often use that word as part of their official names. There is no hierarchy uniting all the Monophysite churches, but they are all in communion with each other, I believe. - the Uniates...offshoots of various and sundry of the above three groups who at different times agreed to accept the authority of the Pope and the doctrines of the Roman Catholic church. This includes the Maronites, Syrian Catholics, Coptic Catholics, Melkite Catholics, Chaldeans, and others. The Assyrians claim descent from the old Assyrian Empire, and until the 1st World War lived in Southeast Turkey around the city of Urfa (formerly Edessa), a former holy Christian city, because its first king Abgar I had received a letter of Jesus Christ himself. They adopted Nestorianism as their religion, but retained their war-loving qualities, and after WWI formed a regiment for the British, which mainly fought the Turkmens of northern Iraq. This made them less liked by the Turks, and the whole Assyrian community fled to Iraq, Syria and in the Russo-Persian frontier area. At present they live a "hidden" existence - the Olympic Champion on the Heptathlon, Gada Shaoua, was an Assyrian from northeast Syria, who did not want to discuss her descent with journalists, for fear of endangering her family. In the Middle East Nestorianism is associated with the Assyrians, but there are still pockets of Nestorians along the Silk Road (not many, though). I read somewhere that there is even a small community of them in Mongolia, discovered by some enterprising traveller. After that discovery they literally hid themselves and have never been heard of since. The Nestorians left a lasting monument in Xian (China), the Xian stone. The Chaldeans are also a group of Armenian Churches. "Hald" was another name for Armenians, and the first to make that mistake (mistaking Chaldeans for Chaldeans) was Xenophon (c. 400 BC), who had Chaldeans living on the heights of the Taurus Mountains in present-day Eastern Anatolia. The Armenians were experts in religious hair-splitting and it is not known how many different kinds of Armenian Churches (or "sects") there are. Regarding Armenians in Persia/Iran: there was a big colony in Isphahan in Fars (South Iran), as well as in Iranian Azerbeidzhan. As they were, and probably still are mainly interested in trade, they are apparently referred to as Armenians from the South and from the North. I must respectfully disagree- as Joe had said the Chaldean Church is a Syriac group, not Armenian- and an offshot of the Church of the East, the Nestorians, not of the Armenian or Gregorian Church, a Monophysite body. See http://i-cias.com/e.o/index.htm and http://i-cias.com/e.o/east_rite.htm (under Chaldean Catholics, Nestorians); http://www.newadvent.org/cathen/03559a.htm and http://www.newadvent.org/cathen/05230a.htm; and http://www.opuslibani.org.lb/church/chaldean/ehistory.htm . It is possible that you are referring to confusion arising from the earlier use of the term Chaldean- which referred to the Neo- Babylonian civilization of the 6th and 7th centuries BCE. The current Chaldean Church took its name from them, but there is no direct connection between the two groups. It was the earlier Chaldeans who were sometimes confused with the Haldians, not the present-day Chaldeans. Further, the Haldians, who were also knowns as Urartians or Vannic, were not the Armenians themselves, but their predecessors in the lands of historic Armenia (although the Armenians do claim a great deal of cultural and ethnic continuity with them). The wavy stripes extending from the center to the four corners of the flag are the three major rivers of our homeland, namely the Tigris, Euphrates and Zawa. The dark blue represents the Euphrates which stands for the Assyrian word prat ("Per-U-Ta"), meaning "abundance." The red stripes represent the Tigris; its blood red hue stands for courage, glory and pride. The white lines in between the two great rivers is Zawa, its white color stands for tranquility and peace. Some interpret the red, white and blue stripes as the highways that will take the scattered Assyrians back to their ancestral homeland. Above the blue star is the image of the Assyrian god Assur, who is guarding the country, the flag, and the nation it represents. On top of the flagstaff is the standard of King Sargon I, who established the first Assyrian empire. During ancient times this insignia stood by the king's side to let everyone know his whereabouts. 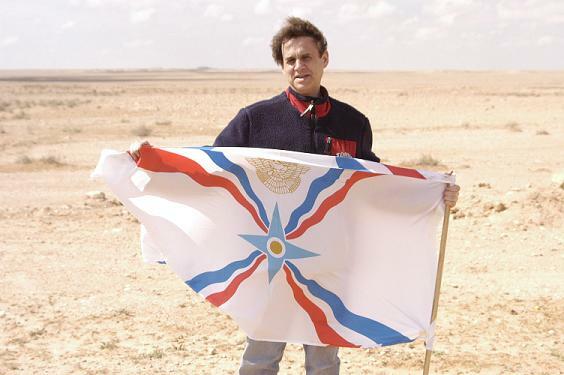 I've seen a picture of a group of Assyrians in Chicago; they're waving the this flag, but both the circle in the center (with a bit more white around it) and the symbol at the top are both in gold, or dark yellow. Last Friday's "Israel HaYom" newspaper had a feature article on Assyrian Christians. 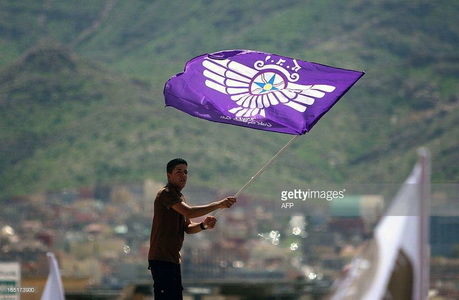 The cover picture showed someone waving a flag which combined a number of symbols we've seen before: A purple flag with the bird symbol in white, a centered circle with the four-pointed compass and wavy lines, and Aramaic writing above and below. You can see it at http://digital-edition.israelhayom.co.il/Olive/ODE/Israel/Default.aspx?pageno=1; (go to page "P1"). Here one can see an Assyrian flag with the Sargon emblem in gold/turqouise instead of the red we show. Also, it is very easy to find photos of a variant with the emblem in gold and white – see photos: 1, 2, 3, 4. Note also the central disk in at least one photo is gold instead of orange-red. It may be that there is no one standard version for these details. 1918 – Assyrians proclaim an independent state (from Ottoman Empire). It seems they used a white (?) flag with a blue cross of unknown size. 1968 – Assyrians adopt on 10 April 1968 their first emblem incorporating the emblem of king Sargon. 1971 – The Assyrian Congress in Teheran adopts a flag similar to the current one but with the Sargon emblem in black and without the blue four-pointed star. 1972 – The flag is changed during the Geneva Congress to one diagonally striped blue-white-red from upper hoist to lower fly, the white stripe being twice larger than the two other ones. In the middle of the flag was the same emblem as in the center of the current flag. 1973 – In Yonkers, the flag is reverted to the 1971 design, but with the blue four-pointed star and the Sargon emblem in red. Wikipedia shows a flag of a short-lived independent Assyrian state during/after WWI: red with white orthodox cross and a small white canton with green dot - unlike the white flag with blue cross we mention. I have added to the Catalan Wikipedia the flags of Assyria and also flags of Assyrian political parties (near the bottom of the page.) The flag of 1920 is a reconstruction; its cross appeared in slighty different feature in Francia Vexilla, where it is also a reconstruction. The flag mentioned by Jakub Grombíř was not a national flag, but a military flag. The Flag Report presented recently another Assyrian flag, yellow with the Sargon emblem in gold and red in the center. It seems to be the Assyrian flag used in the de facto independent Kurdistan (as shown on Kurdish TV), and perhaps also in Iraq, if permitted. Smith [smi75c] reports a flag for the Assyrians, but does note give any reference about its origin. The flag is vertically divided purple-yellow-green, with white crescent and star in the upper hoist, pointing towards lower fly. A small minority of the Assyrians, around 1%, has converted to Islam, but remains Assyrian in culture and language...The flag of the Muslim Assyrian minority is a vertical tricolor of violet, yellow and green, bearing a white crescent moon and five-pointed star on the upper hoist. Minahan includes a «black and white line drawing of its flag», meaning the only color information is the word "violet" in the text. Assuming that this book shares a common (primary?) source with Smith, the brown variant is an error. In the illustration in [smi75b], the violet shade is lighter, but the print quality of this specific stripe is fairly poor. Moreover, the crescent has less prominent points on Smith's drawing. Apart from these, the image on the book shows the shade of yellow as “dark” (Y+), ratio is 8:15, and the purple panel slightly more narrow than the other two; I ignore that and expand the image to 1+1+1 stripes, counting on overcutting in the pasteboard, but the position of the crescent-and-star, at the same distance off both edges of the corner, made me cautious and so the right image is an accurate (I hope) rendition of the illustration in [smi75b], while the left image is an idealization of it. 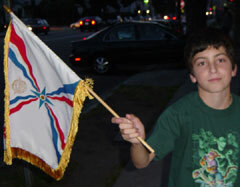 This flag was in use by the Assyrian American Federation prior to 1975 when it dropped for the current Assyrian flag. The three stars represented the Assyrian, Chaldean, and Syriac names of our nation. That is incorrect – the stars actually represent the three main churches of the Assyrian nation, including the Church of the East, Chaldean Catholic Church, and the Syriac Orthodox Church. I have found a website with that variant, so that may have been the source. It is at http://tinyurl.com/5vcve. Since that is a secondary source and the website of the Chaldeans online seems to be a primary one, I'm more inclined to trust the latter than the former. The explanation that seems to me more consistent to what is written in Assyrian-American websites about this is that the assyrians in America were or are trying to push their own designs as the flags of the assyrians worldwide. I can't be certain of this, of course, but that's the feeling I'm getting. I am also more inclined to trust it because the illustration of the magazine cover is indeed a primary source. Further- and I know this point is totally inconsequential as far as hard evidence goes-my subjective aesthetic sense tells me that the purplish-magenta/white/red design is just more likely to have been designed than the orangish/pink/white/red. Unless orangish-pink has some special significance in assyrian culture, who would have picked that? But still, it would be nice to get a second primary source to confirm the colors; magazine inks can be inaccurate. I am not even certain that the illustration from the magazine is a primary source as to colors after all. After looking at it again it seemed that possibly the orignal illustration may have been a simple B&W line drawing, and the color added when it was posted on the web. The other website, www.auf.nu , is an Assyrian site as far as I can tell [not being able to read Swedish]. So I do not see why we should necessarily give greater credence to the Chaldean site as a primary source [although as a matter of fact my hunch is that they are correct in this particular case] In any case, regardless of origins, I would not consider either site a primary source unless we knew that the people who put the information there had actually seen a pre-1975 AAF flag- and we don't know that do we? *I hope we have not sparked a major NFR on this tangent- the relationship between Assyrians, Chaldeans, Syriacs, and/or Aramaics. From what I have seen, it is unresolvable and anything we might post to the website will surely tick off somebody or other in a major way. The community?/communities? cannot agree among itself?/theirselves? and so my own advice is to ignore the issue and just study their flags until they reach their own consensus. I'm not going to go into that swampy region of what's assyrian and what's chaldean, but at the bottom of this very page you mention there are two links to "One Nation-Two Names..The Chaldean/Assyrian Dilemma" and "The Chaldeans/Assyrians Under the Arab Baath Regime of Iraq", among others, that IMHO make less than evident that they don't consider Assyria and Chaldea the same thing, if not historically then at least at the present time. 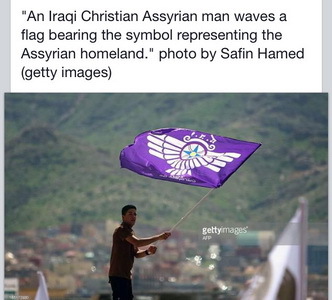 "The purple, white and red colors are the colors of the flag-denoting loyalty, purity and determination respectively -- the red also being reminiscent of the sacrificial blood shed by the Assyrian patriots and Christian martyrs." So the image you found is indeed correct, and the one on FOTW should be modified accordingly. There are two images, one with description, posted recently on the FOTW Facebook page of what seems to be an Assyrian flag although not one I've seen previously and in a strikingly different purple colour. I suspect that this may be a flag of a political party. Apologies if this Is already recorded.